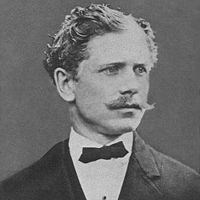 Ambrose Bierce (1842 – 1914, presumed) was born in Ohio, then raised on a farm in Indiana in a very large family with little money, but lots of books. He embarked on a newspaper career at the age of fifteen but, four years later, enlisted in the Union army and gave distinctive service there for many years before resuming his journalism career. Intelligent and ascerbic, Ambrose enjoyed writing satire and social criticism, and was lauded for a distinctive style which he displayed in multiple genres; in particularly, he is considered a master of the American short story. In a bizarre, late-life adventure, Ambrose traveled to Mexico and began traveling as an "observer" with Pancho Villa’s army. He was last seen in Chihuahua and last heard from on the day after Christmas in 1913; no one knows what became of him, though there have been several movies and books speculating on his demise and final days. What a hilarious poem! This reminds me of Isaac's Storm, a great book by Erik Larson about the 1900 hurricane that destroyed Galveston. The title comes from Isaac Cline, the weather forecaster there in a time when they truly were thought to be just charlatans. Based on the attitudes in the book, Mr. Bierce probably thought there was some truth in these lines. I laughed out loud! Thanks for making us aware of this poem. I love it! I am still laughing. Thanks!